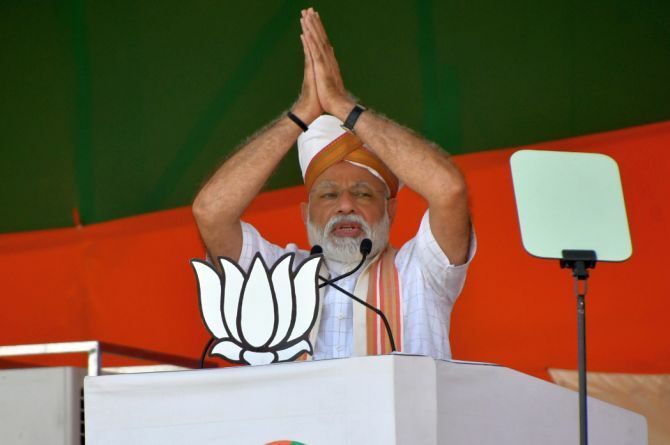 Invoking the Balakot air strikes inside Pakistan, Prime Minister Narendra Modi on Tuesday asked first-time voters for the upcoming Lok Sabha polls to dedicate their vote to those who carried out the daring operation to target a terror camp. 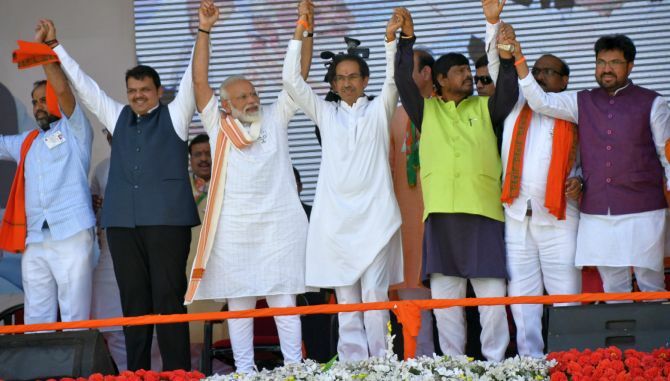 Modi also urged the voters to dedicate their first vote to the slain Central Reserve Police Force personnel in the Pulwama terror attack and to the cause of providing pucca houses to the poor, water in farms of farmers and 'healthcare for all'. The first phase of the multi-phase parliamentary elections begins Thursday. The remarks by Modi on the Indian Air Force operation on February 26 while addressing rallies in Maharashtra and Karnataka prompted the Communist Party of India-Marxist to write a letter to the Election Commission alleging violation of model code. 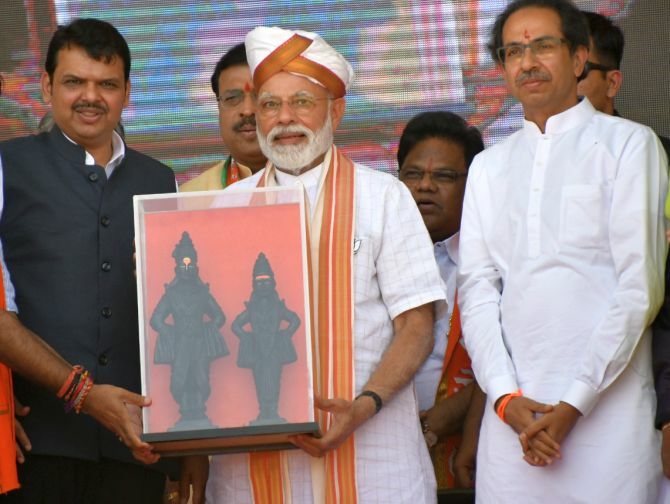 The Election Commission has taken cognizance of Modi's remarks and has sought a report from poll officials in Maharashtra. 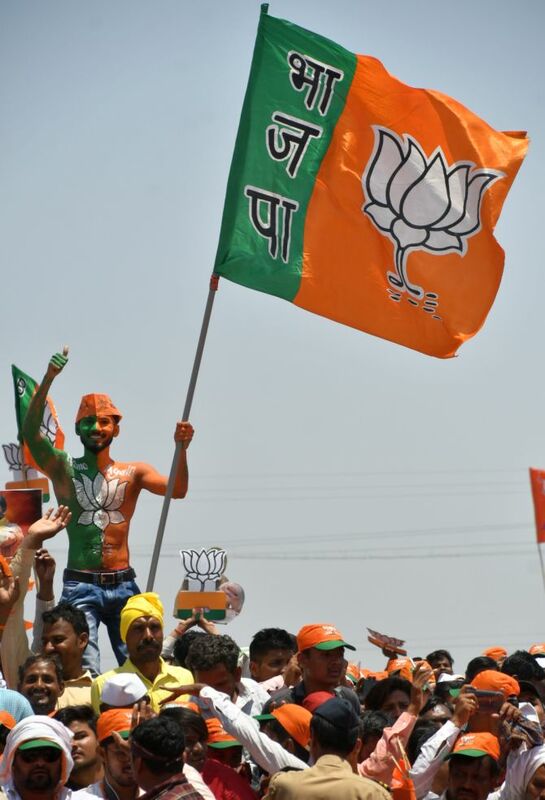 Sources in the poll panel said Tuesday that the chief electoral officer of Maharashtra has been asked to submit a report at the earliest. The report has been sought in the context of an EC advisory issued last month asking parties to desist from indulging in political propaganda involving actions of the armed forces. commission had said on March 19. "With deep anguish we are drawing your attention to the latest violation of Model Code of Conduct (MCC) by Prime Minister Narendra Modi. He is also violating the specific direction of the Election Commission to refrain from invoking the armed forces for seeking votes," CPI-M politburo member Nilotpal Basu said. Congress spokesman Kapil Sibal told reporters in Delhi there should be no politics in the name of our martyrs, but it is happening and the 'sad part' is that the Election Commission is also not doing anything about it. The EC issued an advisory on March 19 asking parties and their candidates to desist from indulging in any political propaganda involving activities of defence forces during their election campaign. 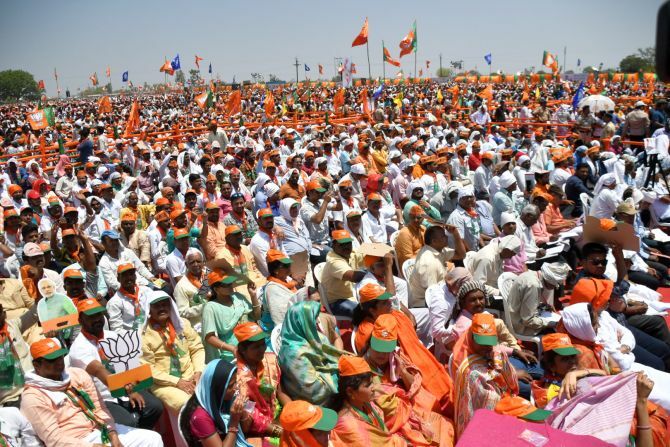 "Can your first vote be dedicated to those who carried out the air strike," Modi said, appealing to the first-time voters at his rally in Ausa in Latur district in Maharashtra. "I want to tell the first-time voters: can your first vote be dedicated to the 'veer jawans' (valiant soldiers) who carried out the air strike in Pakistan). "Can your first vote be dedicated to the 'veer shaheed' (brave martyrs) of Pulwama (terror attack)," Modi said. As many as 40 CRPF personnel were killed in an attack on their convoy in Pulwama in Jammu and Kashmir by a Jaish suicide bomber on February 14. Modi said the first-time voters should remember that their first vote is something which they will remember for the rest of their lives. "You will always remember to whom did you vote and in which election." "Can your first vote be dedicated to (the cause of) providing pucca houses to the poor?. Should not your first vote go for providing water in farms of farmers?" he asked. "Should not you vote for 'healthcare for all' and the Ayushman Bharat scheme," Modi said. Modi spoke on similar lines at his rally in Chitradurga in Karnataka while greeting first time voters across the country and asked them to vote after thinking to bring a strong government in the country. He said in this Lok Sabha elections people have to choose not only an MP or a prime minister, but a strong government for a strong India. "Only a strong government can take firm decisions for the benefit of the country." Citing how a strong government functions, Modi again referred to the Balakot air strike in response to the Pulwama carnage. "There was a time five years ago, when Pakistan's terrorists used to attack us and Pakistan used to threaten us. Our brave soldiers used to seek permission for action, but the government then sat in fear." "This chowkidar (watchman) has changed the situation. Now if there is fear, it is on the other side of the border. People sitting in power there are getting different types of nightmares...terrorists are frightened after Balakot attack," he said. Devoting a significant part of his speech to national security, he asked the crowd, "when we attacked Pakistan's terrorists did you like it or not? Are you happy? Did I do right?" to which it roared in approval. "When we attacked terrorists it pained Pakistan, but tears could be seen among those in Congress and JD-S," Modi said. The Janata Dal-Secular and the Congress are ruling coalition partners in Karnataka. He said the whole world stood with India, but "our Mahamilavati dal here" (Congress-JDS), was condemning Modi instead of Pakistan. "I want to ask the chief minister whether his vote bank is in India or in Pakistan? The chief minister should clarify on this," Modi said. Under the BJP's watch it is the policy of 'New India' that it will kill terrorists by barging into their dens, he said. National Conference leader Omar Abdullah hoped that first-time voters ask the prime minister why the Balakot air strike became necessary. "I hope the first-time voters ask PM Modi why Balakot became necessary in the first place. Why did the Pulwama attack succeed? On whose watch have attacks in Uri, Pathankot, Sunjwan (Jammu), Nagrota & Pulwama happened? Don't reward Balakot, punish Pulwama! (sic)" Abdullah tweeted. PDP president Mehbooba Mufti also took a sarcastic swipe at the prime minister. "Repeat after me. MCC is Modi Code of Conduct," she tweeted. Stepping up his attack on the Congress, Modi said had its leaders acted wisely, Pakistan would not have been created. Pakistan would not have been born in 1947 had Congress leaders acted wisely in the pre-Independence era, Modi said. The Congress party's manifesto speaks the same language as that of Pakistan, he added. Modi also attacked the Congress over the recent income tax raids at several locations, including in Delhi and Madhya Pradesh, against close aides of Madhya Pradesh Chief Minister Kamal Nath and others on charges of tax evasion and hawala transactions. He alleged that corruption was the only activity which the Congress does "with honesty" after coming to power. "You must have seen how boxes full of currency notes are being recovered from the houses of Congress courtiers. Buying votes shows their political culture. They are saying for the last six months that the watchman is a thief but from where have the notes come out and who is the real thief?," Modi said. Congress president Rahul Gandhi has been attacking the prime minister using the 'chowkidar chor hai' phrase, alleging corruption in the Rafale deal.